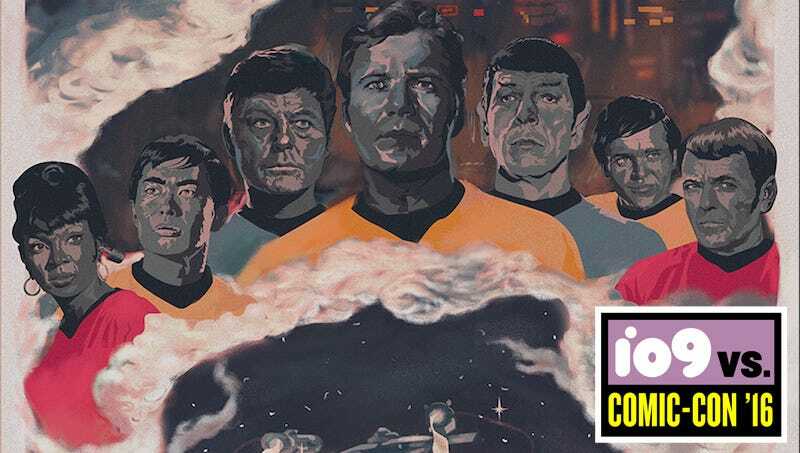 Celebrating a half-century of all things Starfleet, Star Trek 50: Artists 50 Years is a wonderful art exhibit that kicking off at this year’s Comic-Con before hitting the road to Las Vegas, Toronto, New York, and other cities (the full list is here). But if you can’t make it to those, here are a few pieces from inside the exhibit in San Diego, followed by a few of our favorite pieces in the show. Phasers Set to Stunning by Ryan Christopher Ross. And yes, that’s Mayim Bialik. If you’re in San Diego, the exhibit is open Thursday, July 21 through Saturday, July 23 from 11am to 8pm and Sunday, July 24 from 10am to 5pm. It’s free, there will be signings and for more information, visit this site. Which Time Travel TV Show Remake Should You Watch, Time After Time or Frequency?